Andy Murray found his form on clay to thrash Milos Raonic 6-2 6-0 and set up a semi-final against Rafael Nadal at the Monte-Carlo Masters. Murray struggled through his opening two matches against Pierre-Hugues Herbert and Benoit Paire, trailing by a set and a double break against the latter on Thursday before somehow finding a way through. Perhaps surviving that scare - with a lot of help from a nervous opponent - snapped Murray back into gear as he was focused and ruthless against an ailing Raonic. The Canadian has stepped up a level this season and pushed Murray to the limit in the semi-finals of the Australian Open. But physical frailty, an Achilles heel throughout his career, cost him that day and it was the same again here. He received treatment to his leg in his third round win over Damir Dzumhur, the second successive match in which he was taken to a deciding tie-break. Raonic looked sluggish from the off against Murray, who was able to take full advantage of the Canadian’s errors. His serve, which had been so shaky against Paire, was on song and he did not have to save a single break point all match. Two breaks of Raonic’s big serve helped Murray win the first set and the second was one-way traffic, with the world number two wrapping up victory after only an hour and six minutes. The Scot, who suffered early defeats in Indian Wells and Miami last month, told Sky Sports: “The two most important shots in tennis I did really well. I served very well and my return was very good. When he missed the first serve, I was being very offensive. Murray is through to the last four at the tournament for the third time and first since 2011, when he also met Nadal. The eight-time champion looked in excellent shape in beating Stan Wawrinka on Friday but Murray won their last match on clay in the final of the Madrid Masters last season. Murray had hoped to make it into the semi-finals of the doubles as well alongside Davis Cup team-mate Dominic Inglot but Herbert got his revenge as he and fellow Frenchman Nicolas Mahut saved a match point to win 6-4 3-6 12-10. 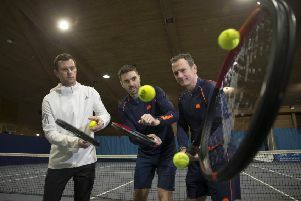 Jamie Murray did reach the last four as he remained unbeaten since taking over the world number one doubles ranking. With only a five-point lead over former incumbent Marcelo Melo, Jamie must maintain his excellent form with Brazilian Bruno Soares to hold onto top spot. And they certainly had no complaints after a 6-2 6-3 win over sixth seeds Rohan Bopanna of India and Romanian Florin Mergea. Jamie received treatment to his thigh after the first set but did not seem to be hampered as the fourth seeds set up a last-four clash with Brazilian Melo and his Croatian partner Ivan Dodig. Victory would give Jamie a bit of breathing space, while defeat could pave the way for Melo to move back ahead.